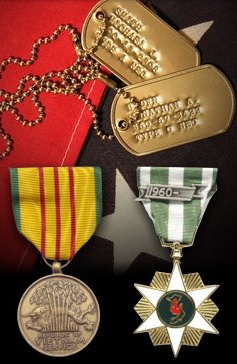 How are Vietnam Veterans any different from the veterans of other wars and conflicts? This is a humble effort to respond to that question. It represents the opinions and feelings of a single Vietnam Veteran who has asked to remain anonymous. His reason? He does not feel worthy to speak for everyone who served and sacrificed. Hopefully, this will speak to the hearts of those who once traveled to Vietnam and then returned to a cold and ungrateful nation. Historians have attempted to define the Vietnam War and the Vietnam Veteran by analyzing times, places, and events associated with “The War.” Unfortunately, misunderstandings, distortions, and bias have led to conclusions not based in fact. The Vietnam War was not unique, and neither were the 2.7 million young Americans who served there. There is little evidence that the time was unique. True, it was a time of the Beatles, Rock & Roll, dissent, civil disobedience, and demonstrations. But, still, it was not that much different from other turbulent times in the history of our nation. The place was similar to the Philippines, Okinawa and other islands, where American servicemen fought and died during World War II. The events, as horrific as war can be, were similar to those of previous wars. The author’s absolutely brilliant analysis of this phenomenon explains in clear and concise detail why Vietnam and the Vietnam Veteran are so different. This powerful analysis captures the essence of the debate in a single sentence: “It is not so much what sets Vietnam and the Vietnam Veterans apart, but what so strongly binds them together.” This analysis is long overdue. There is something about the conflict in Vietnam that sets it apart, that makes it difficult to adequately explain to others. It is like a mist, wafting from a broad tapestry of rice paddies – without form or shape – something that escapes the grasp and cannot be held and only barely seen. It defies description, yet the memory of it brings chills to those who once beheld it. William Tecumseh Sherman said, “War is hell,” and he was right. Vietnam was neither the first or last war to prove Sherman correct. The horror of Vietnam was not what makes it different, although it certainly had its fair share of death and destruction. Some commentators have suggested that Vietnam was unique because it was the first war that was projected from the television screen into the family living room. Certainly, this is true, but it speaks more to the impact that it had on the civilian population than it does to any lasting effect that it wrought on the minds and souls of veterans. Often, the comment can be overheard that Vietnam was not a good war, or a just war -- that the soldier, sailor, marine, airman and coastguardsman was not fighting for a cause. Usually, those who make that judgment are basing their opinion on their own disdain for the war. Whether the “domino theory” was valid should not call into question that, at least in the early years, the American fighting man felt he was engaged in a bad or unjust war. Most believed that they, like their fathers and grandfathers before them, were doing their part to defend our nation and its principles against foreign enemies and their aggressive, Marxist ideology. Certainly, it is clear that the struggle in Vietnam became an unpopular war. The Hollywood screenwriters have done all within their power to perpetuate that image. The facts suggest, however, that they have it wrong about the Vietnam Veteran. Most were not, as the entertainment industry would have us believe, drug addicts, baby killers and psychopaths. When our men returned home, they came back to an alien and hostile environment. Even in their own homes, they were often strangers. For the most part, however, the vast majority hurriedly got on with their lives and became productive members of society. Maybe it was the longevity of the conflict in Vietnam that is its most unique characteristic. Even the exact time span is an area of disagreement for historians. Since it was another undeclared conflict, there is no real consensus about when it actually began. The United States of America last declared war on 8 December 1941, and it has not been in a declared state of war since the early days of September in 1945. While the Vietnam Conflict received government sanction with the Gulf of Tonkin Resolution, some set its beginnings in 1959. If valid, Americans fought in Vietnam from then until the Paris Peace Accord in 1975, some sixteen years in all. Our next lengthiest period of fighting was the American Revolution, which lasted for seven years, less than half of our tenure in Vietnam. Consider this: A child entering the first grade in 1959 was potentially graduating from college in 1975. So, if the duration of the Vietnam experience is a common denominator, how can we judge that it is the greatest single factor that sets the Vietnam Veteran apart? We have submitted that the field of battle was horrific, and, on that point, there is little debate. All wars are hell – always have been, always will be. The conflict in Vietnam played out in the intimate living rooms of America and brought the ugliness of battle into clear and sharp focus. A nation accustomed to the propaganda and pep rally variety of newsreel footage from World War II recoiled in shock and disgust. How would they have reacted to virtual scenes from Okinawa? All across America, critics and political pundits began to make the case that, unlike the war against Nazi Germany and Imperial Japan, Vietnam was just an abstract exercise in international brinkmanship, and it had no high moral purpose or objective. Containing communism, they debated, was an unrealistic exercise in futility. The poor North Vietnamese and their helpless Viet Cong cousins in the South were mere pawns in a nasty game between the two Super Powers. Long frustrated by Roosevelt’s censorship and McCarthy’s hideous excesses, Hollywood producers and directors began to vigorously state their case for opposing American involvement in Vietnam. Meanwhile, the struggle would not go away. Make no mistake, the Vietnamese communists were a determined, tenacious and, yes, valiant enemy. They were well-armed by their sponsors in China and the Soviet Union, and what they lacked in weaponry, they more than made up for in improvisation and tenacity. Anyone who bought the propaganda that they were merely pajama-clad farmers did not face them in the field. Most surviving American servicemen will willingly, albeit begrudgingly, describe their respect for their Vietnamese foes, and their contempt for their Vietnamese allies. Today, it’s abundantly clear that the overwhelming will of Vietnam’s people ran contrary to the aims of the American forces sent to save them from communism. Americans have a long history of being an impatient people. Our countrymen could not comprehend the spiraling, bottomless vortex that our political leaders had plunged us into. Even four-year wars as horrible as the Civil War and the Second World War seemed to pale by comparison with Vietnam. The American public did not understand or appreciate then, and many still do not appreciate today, that our own government stood between our military forces and victory. If we could not win, then the war must be too horrible for our men; it must be corrupting our boys – as portrayed on television sets and in the movies; and it was obviously the wrong cause, in the wrong place, at the wrong time! Americans were weary, even bored with the conflict in Vietnam, and they were ready for it to go away. Unwilling to risk drawing Russia and China into the conflict, and vastly overestimating each, the United States government elected to fold its tent. Fifty-eight thousand plus Americans dead was the cost for the politicians’ poor estimate of our adversary, constant meddling without true understanding, and lack of resolute fortitude. All that they demanded of their troops in the field, they themselves were found lacking in abundance. What a terrible price to pay for a catastrophic cacophony of political blundering. And, yet, South Korea, Nationalist China and Japan remained free – bastions of Asian democracy. Vietnam’s immediate neighbors – Cambodia, Laos and Thailand -- eventually assumed a semblance of self-rule and independence from the communist colossus. Containment in Vietnam, it seems, did work. No more dominoes fell. Despite capitulation by their government, our troops prevailed on the battlefield, and they stopped communism in its tracks. Anyone who suggests that all who died did so in vain has a poor understanding of modern history and does the sacrifice of our brave countrymen a great and unforgivable disservice. So, let’s return to our original query. What, if anything, sets the Vietnam Veteran apart from all others? What separates him from the heroes of Normandy, Iwo Jima and Incheon? Clearly, the Korean Veterans’ experience comes closer than the rest. Theirs’ too was an undeclared, unappreciated and “forgotten” war. And, lest we forget, there were plenty of American fighting men who were engaged in all three of those disputes. In one sense, the answer is, simply put, nothing does. There is a brotherhood of warriors that transcends all considerations for time, place, nationality, branch of service and results of the conflict. That brotherhood knows neither victor nor vanquished, neither survivor nor casualty, neither rank nor title. The sad fact of history is that, for a time, the American public set itself apart from its own fighting men. The overblown myth is that they spat on Vietnam Veterans in vast numbers upon their return. The otherwise rarely stated reality is that too many Americans averted their eyes from their returning fighting men and regarded them with pity, shame and contempt. Eventually, public perception began to change, but it was a long time coming and too late for many. So, upon reflection, the question should not be so much about what sets the veterans from Vietnam apart, but what so strongly binds them together. The answer lies in our study of the hypothetical. No single one of the above-named factors welded together this brotherhood. Rather, all dovetailed into a belief that the conflict in Vietnam was an episode in America’s history that might best be forgotten, so much dust that had sullied our national pride and brought dishonor upon our men and women in uniform. Without even being aware of it, returning Vietnam Veterans circled their subconscious, psychological wagons. They bowed their heads and avoided the subject to the extent that far too many emotions swirled trapped in their troubled minds and lay festering in their souls. Healing was denied them and postponed indefinitely. For the most part, they suffered quietly, reared families and went about their business. Eventually, the draft was scrapped -- the same conscript system that had provided citizen-soldiers for the trenches of France in 1918. America’s defense transitioned to an all-volunteer, professional fighting machine. Most of its noncoms and many of its officers were veterans of Vietnam, determined to create a new fighting force that would not be manipulated and abused like that of the boys who had fought in the distant jungles of Southeast Asia. America’s new fighting forces performed brilliantly in places like Panama, Bosnia and Kuwait. And, even though they were betrayed by our government again in Somalia, the real culprit was apparent. Unleashed, our newly revitalized military overcame the lingering doubts and suspicions that had haunted them since Vietnam. With the militaries’ reemergence, the Vietnam Veterans slowly began to move out of the shadows. A renewed patriotic spirit seemed to blow across America. Repatriated, gray-haired Vietnam Veterans began to seek one another out, to stand together to recognize the new breed of warrior that had assumed their places. Now in positions to be heard, their common goal was to make sure that today’s veterans would be shielded from unjust criticism. “Never again,” became their mantra! The process was gradual, to be sure, but it began to take hold and to spread among them. Freed at last, whenever one Vietnam Veteran chanced to meet another, he would often be heard to say, “Welcome home, Brother.” Long denied a proper welcome by their fellow citizens, veterans took it upon themselves to redress the grievance of so many years past. Determined, but with neither animosity nor bitterness, those who had served in Vietnam had finally begun to find their own way home. And, there came THE WALL. At long last, here was a proper symbol, which boldly stated their case and respectfully honored their fallen comrades. And, like their war, and like their service, it stood beyond definition and description. Vietnam Veterans stand before it, or kneel, and they reach out to touch it, to run their fingers gently over the inscribed names. They see themselves reflected in the stark blackness, and the memories are rewound through trembling fingers, and they, finally, see through the mist of time and remember those who were lost, who were denied the fullness of life, and they are reborn in sacred duty and responsibility toward their fallen brothers and sisters. The feelings of remorse are never completely washed away, and the debt lingers in their collective hearts. But, this sense of guilt is common to all surviving veterans, and it is not unique to those from Vietnam. It is good and proper that the fallen be always remembered, and it is an unspoken covenant that serves well both the living and the dead. It is a burden that is willingly shouldered and rightfully carried by all veterans from each war and for all time. Those on THE WALL gave their lives that others might live, and they should never be forgotten. It is the duty of the living to always honor them, to save a place for them in their hearts, and to keep those promises made in those days long ago. More than anything else, it is THE WALL that has brought Vietnam Veterans back into the light of day. In it, they themselves are validated; their service was not for naught, and their devotion to duty is articulated in the inscribed names of their fallen comrades, those gentle heroes who were left behind. As their watch draws nearer to its end, they understand now that they will be remembered as a generation which placed country and sacrifice above self, despite criticism, and that, when their nation called, they answered and served with honor and devotion. Yet, they were separated and even ostracized for so long, that Vietnam Veterans have assumed a sense of pride in their individuality and uniqueness, and they express it in many different ways. Their bond remains esoteric, deeply personal and indescribable. Think not ill of them because of their enigmatic nature and accept them for the stalwart defenders of all of our veterans that they have become. Their image remains clouded in the mist of time and so it shall, forevermore. who was killed over Cambodia in 1970. May he rest in peace. Thank you, and Welcome Home, Brothers!